Typically, compact chest freezers are those with capacities of less than 5.0 cu ft. (As a rule of thumb, freezers with 6.0-9.0 cu ft capacities are categorized as small, 12.0-18.0 cu ft as medium and those with more than 18.0 cu ft as large). Because they tend to be the smallest in the chest freezer category, they also double as cheap freezers. They are therefore the perfect choice for those who are just starting out and are on a tight budget. Owing to their tiny footprint, they are incredible space savers. They are therefore ideally suited for small areas and will not clutter your home. They give you the extra space you need to store items such as meats and snacks. As such, they are the perfect complement to the cold storage provided by fridge freezers. They are a great money saver because they give you the power to buy meat and veggies for example, in bulk. They help you save time, too. With this nifty little appliance, you are able to cook a month’s dinner in advance. Or make the whole family’s snacks for an entire week. They are light and portable and can be carried anywhere—upstairs, downstairs, garage, to the holiday home—and back again effortlessly. If you are looking for a compact chest freezer to provide years of reliable service, we suggest you take a look at the models reviewed below. A compact design. Approximate dimensions (WxHxD) of 18.25 in x 32.75 in x 22 in means that this compact chest freezer offers the best of both worlds: bulk frozen storage but also a tiny footprint. Its space saving design also includes a recessed handle. Therefore, it will not clutter tiny living spaces such as offices and condos. And, you will not trip trying to navigate tiny spaces. A power indicator light lets you know the power status of your freezer at a glance. As such, you are able to take quick remedial measures to safeguard your food investment. Adjustable temperature control makes it easy to change the temperature settings of your frozen items as needed. Plus, the flip up lid creates an airtight seal that keeps the cold locked into the chest freezer, maintaining your food fresher for longer. A storage basket makes it easy to stack and organize food, particularly tiny items such as a packet of peas. And, the basket can be completely removed from the freezer in order to create room for bulky items. A defrost drain somewhat takes the sting out of the otherwise bothersome defrosting exercise. Even though it is not Energy Star qualified, it consumes only 186 kWh per year. This works out to an electric bill of US$ 22 per year, or less than US$ 2 per month, which is affordable by any standard. This compact chest freezer’s white cabinet makes it easy to keep clean. It also makes it an ideal addition to virtually any kitchen or office décor. A shipping weight of 63 Lbs. and unit weight of 57 Lbs. make it relatively cheap to ship and easy to move around the house or office. The Avanti 2.2 cu. ft. chest freezer is a great space saver and comes highly recommended for especially tight spaces. The Danby 3.6 cu. ft. chest freezer (Model # DCF401W1) provides handy freezer storage for your kitchen, garage or office. With approximate dimensions (WxHxL) of 22.0 in x 32.88 in x 24.88 in and shipping weight of 79.4 Lbs., this freezer will fit neatly in the smallest of spaces. Plus, it has a largely flat back although the power cord outlet and lid hinges protrude a little. Thanks to 2 rear casters (wheels on swivels), this already literal lightweight is that much easier to move around the home or office, even when it is full. So there is no need to break your back if you feel its current location isn’t quite right. The thermostat is perfect for setting and altering the temperature of your frozen foods. Plus, it’s front-mounted for easy access and monitoring. Power is automatically restored after a power outage, reducing the probability of losing your food investment, especially when you are away from home for a prolonged period of time. The storage basket measures approximately (WxHxL) 8.25 in x 7 in x 14 in. This is large enough to hold 2 loaves of bread and a couple of muffins or about a dozen frozen veggies. And because the basket is vinyl-coated, it’s sure to give you years of reliable, corrosion-free service. The defrost drain takes the sting out of defrosting your freezer, an exercise which must be carried out periodically in order to ensure that your freezer doesn’t metamorphose into an unwelcome energy guzzler. As is the case with most of the other bestselling compact chest freezers, this model does not come with a lock. However, it has a few things going for it, as highlighted above. The bottom line though, is that, owing to its sturdy construction and foam-insulated lid and cabinet, it keeps your food frozen solid. The Igloo 3.6 cu. 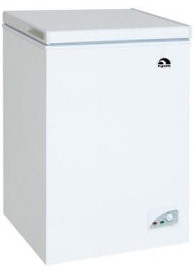 ft. chest freezer (FRF434) is the smallest of the Igloo deep freezer configuration. Igloo is fast gaining popularity in America and Canada as a dependable brand. With approximate dimensions (WxHxL) of 22.25 in x 32.5 in x 22.25 in and a shipping weight of only 69.3 Lbs., it features a compact and upright design. It is therefore a great space saver for tiny homes and offices. Front-mounted power on and run indicator lights assure you that your freezer is powered and is running optimally. As such, you don’t have to keep opening the freezer to know whether your food investment is safe. The thermostat dial enables you to set and adjust the temperature of your frozen foods with precision. This is especially useful if you are going to use your compact freezer to store different types of food that require different ideal temperature settings. The durable wire storage basket is perfect for storing frequently used items as they are then easy to retrieve. A removable defrost drain makes it easy to clean and defrost your mini deep freezer, as it helps you to route the waste water out of the unit with just a tilt. This Igloo compact chest freezer doesn’t come with a key and lock though. If this is not important to you, it makes a great investment and will pay for itself in no time. The 5.0 cu. ft. Frigidaire FFFC05M4NW is the tiniest of the Frigidaire chest freezers. It isn't just one of the best known mini deep freezers, it is also America and Canada's bestselling compact chest freezer. And, it’s a great investment for anyone who already owns a refrigerator but needs extra freezer space. With approximate dimensions (WxHxD) of 28.5 in x 32.5 in x 22 in, this chest will occupy only a tiny floor area and is perfect for small rooms. The power indicator light is great for checking the power status of your freezer at a glance. The adjustable temperature control makes it easy to adjust the temperature of your frozen food as needed. The control dial is conveniently located on the bottom right side of the freezer’s exterior. Like most compact chest freezers, this model does require to be manually defrosted periodically. Thankfully, the defrost drain makes this exercise effortless. The storage basket is a great place to keep tiny, hard-to-find items that would otherwise lay buried at the bottom of the freezer. And, this basket can be lifted out completely in order to make room for oddly shaped items. Besides being affordable, it is an amazing money saver, as it enables you to stock up on sales. 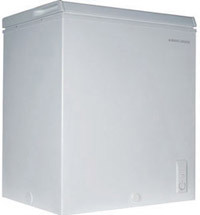 In addition, because it is a compact chest freezer, it is inexpensive to operate and won’t run up your electric bill. 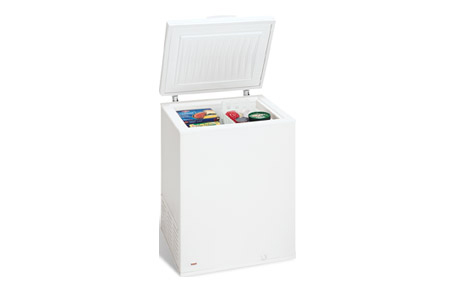 This compact chest freezer is designed, built, and engineered in the US. So, if you place a premium on American quality, this model is right up your alley. This model’s motor runs quietly. As such, it won’t intrude on the cherished peace and quiet of your home or be a distraction in your office. The white color option is guaranteed to add a clean look and feel to any room. Even though in keeping with its size, this 5.0 cu. ft. Frigidaire chest freezer only has a modest raft of features, it nevertheless does an incredible job of freezing food rock solid. As is the case with the preceding competitor brands, the GE FCM5SUWW, with a capacity of 5.0 cu. ft. is the smallest of the GE chest freezers. It is also one of the popular freezers in the US and Canada and is a great complement to a refrigerator. While it will not hold an entire cow, it can freeze around 175 Lbs. of food. It can therefore still enable you to buy in bulk, thereby helping you to rake in some savings. With approximate dimensions (WxHxDW) of 28.31 in x 33.25 in x 22 in, it has a small footprint, making it ideal for petite apartments, condos, RV homes and offices. The adjustable temperature control gives you the power to set and change the temperature of your freezer to accommodate different food types. For example, meats do best at sub-zero settings while soft-serve ice cream requires warmer settings. The power on light gives you, at a glance, the assurance that your freezer is properly powered and that your food investment is safe. The defrost drain makes the periodic manual defrosting exercise relatively unchallenging. The storage basket is a great place to store frequently used items so that they are easy to retrieve. Annual energy consumption is estimated at 240 kWh, which translates to a cost of US$ 26 per year, or just US$ 2.17 per month. Thanks to its textured aluminum cabinet liner, foam insulation in both the cabinet and lid as well as wraps around the condenser and evaporator, this GE compact chest freezer operates quietly and will not disturb your home's priceless tranquility. The icing on the cake is that this freezer gets its primary job of keeping food frozen done. So it is a reliable compact chest freezer to settle for. The 5.0 cu. Ft. Black & Decker (Model # BFQ50), which is a compact freezer without refrigerator is fast becoming a favorite among American and Canadian consumers. Its compact dimensions (WxHxL) of approximately 28.38 in x 33.25 in x 22.06 effectively democratize chest freezers. 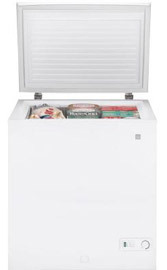 Now, you don’t have to own a large home or office to own a standalone chest freezer. It provides versatile freezer storage that can gobble up around 150 Lbs. of food, with space to spare for odds and ends. A thermostat dial lets you set and adjust the freezer’s internal temperature as needed. Plus, it's front mounted for easy access and visibility. The wire storage basket is a great food organization tool and is the ideal place to store packets of carrots if these are standard ingredients to your meals. And, the vinyl coating on the storage basket makes it both rust-proof and durable. A defrost drain makes the mandatory defrosting exercise less tedious. The warranty is as follows: 12 month for defective parts and workmanship and 5 years for the sealed system (compressor, condenser, evaporator and all connecting tubing). Within the stipulated time frames, the manufacturer will provide all labor and in-home service to remedy these defects. All this at no extra cost to you. It comes in white so it will seamlessly blend in with your kitchen or office’s light-themed or contrast décor. 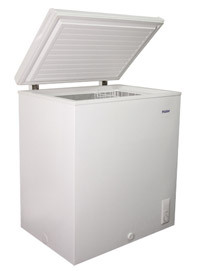 Investing in this mini chest freezer will give you the peace of mind that comes from owning a tried and true brand. Plus, it is likely to be more reliable than less tested brands. The Haier 5.0 cu. 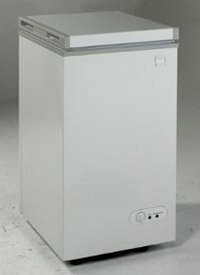 ft. mini deep freezer (Model # HCM050EC) is a hard working addition to any home, particularly those with space constraints. With WxHXL measurements of approximately 28.34 in x 33.22 in x 22.03 in, a shipping weight of only 86 Lbs. and a flat back design, this Haier chest freezer provides compact freezer space that won’t clutter small living spaces. Yet it is big enough to empower you to shop and cook in bulk, saving you precious time and money. The internal dimensions (WxHxL) are approximately 23 in x 27 in x 15.5 in. This gives you enough space to store an incredible 175 Lbs. of food. So you can eat out of your freezer and spend the enormous cooking time saved enjoying your favorite pastime, such as going for a long, stress-free walk. A power on indicator light lets you know, at a glance, the power status of your freezer. As soon as you notice that the power is off, you are able to take immediate corrective measures to avert spoilage of your precious food. An adjustable thermostat takes the guesswork out of setting the correct temperature for your food, which, by the way, is also a good way to prevent freezer burn. The defrost drain is a welcome feature, as it makes it easy to clean and defrost this compact chest freezer when ice builds up. The storage basket is great for storing tiny items that would otherwise get lost in the sea of other food. That the food basket can be completely removed to create room for bulky or oddly shaped items speaks to the freezer’s versatility. The cabinet is made of durable steel, assuring you of many years of worry-free service. The 12 month warranty on parts and labor, and 5 years warranty on the sealed system assure you that defective parts and workmanship that become evident within the stipulated time frames will be remedied free of charge. Although the Haier 5.0 cu. 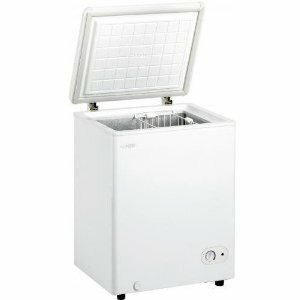 ft. mini deep freezer has a modest raft of features, it gets the primary job, of keeping your food safely frozen, done. You can therefore look forward to spending less time shopping and more time on your favorite pastimes.